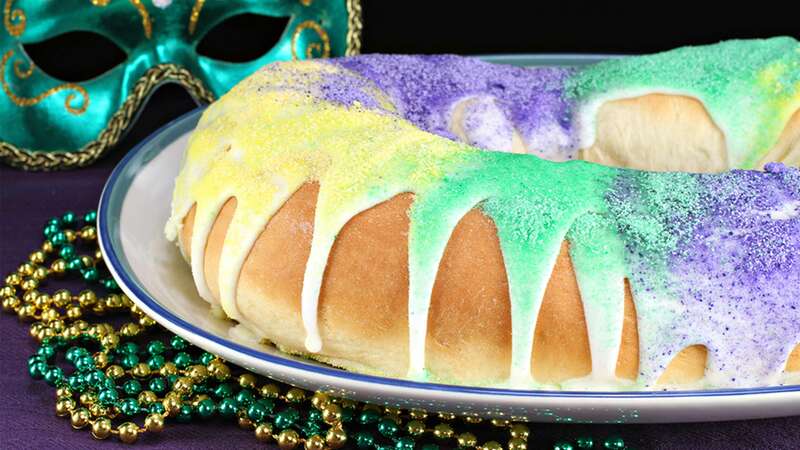 Ring- shaped and decorated in gold, green and purple with a trinket baked inside, often a plastic baby, the king cake tradition is firmly rooted in French New Orleans culture. The trinket is called a feve, the French word for "bean" which was originally baked in the cake. Whoever gets the slice with the feve or baby is assigned the task of making next year's king cake. Who will receive the surprise slice? Pour warm water into a small shallow bowl, and sprinkle yeast and 2 teaspoons sugar into it. Allow the yeast and sugar to rest for three minutes then mix thoroughly. Set bowl in a warm place for 10 minutes, or until yeast bubbles up. Combine 3-1/2 cups flour, remaining sugar, nutmeg and salt, and sift into a large mixing bowl. Stir in lemon zest. Separate center of mixture to form a hole and pour in yeast mixture and milk. Add egg yolks and using a wooden spoon, combine dry ingredients into the yeast/milk mixture. When mixture is smooth, beat in 8 tablespoons butter (1 tablespoon at a time) and continue to beat 2 minutes, or until dough can be formed into a medium-soft ball. Place ball of dough on a lightly floured surface and knead, gradually adding up to 1 cup more of flour. When dough is no longer sticky, knead 10 minutes more until shiny and elastic. Using a pastry brush, coat the inside of a large bowl evenly with one tablespoon softened butter. Place ball of dough in the bowl and rotate until the entire surface is buttered. Cover bowl with a heavy kitchen towel and allow to rise in a warm place for about 1-1/2 hours, or until dough doubles in volume. Coat a large baking sheet with one tablespoon of butter and set aside. After the first rising, place dough on a lightly floured surface and punch it down. Sprinkle cinnamon over the top, pat and shake dough into a 'snake' or 'cylinder' shape. Twist dough by forming the cylinder in half, end to end and pinch together to complete the circle. Place the ring on the buttered baking sheet, cover dough with towel and allow to rise for 45 minutes or until the dough doubles in volume. Combine slightly beaten egg with milk and brush top and sides of dough with mixture. Bake in a preheated oven at 375 degrees for 25 to 35 minutes or until golden brown. Cool on a wire rack and hide the plastic baby inside the cake. Divide sugar into three portions. Add a dab of coloring paste to each sugar portion. Mix the sugar and colored paste until the color is distributed evenly, place on wax paper. Set aside. Combine sugar, lemon juice and 3 tablespoons water until smooth. If icing is too thick, add more water. Spoon icing over top of cake. Immediately sprinkle colored sugars onto icing, alternately between the three colors. Cake is served in 2- to 3-inch pieces.